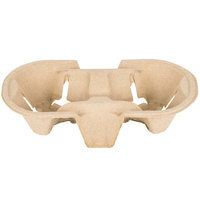 Green, Biodegradable Cup Carrier Trays Allow Customers to Take Your Delicious Drinks To-Go! All of these cup carrier trays are made with renewable resources that decompose to avoid clogging landfills and harming the environment. Some products are approved by the Biodegradable Products Institute, which ensure that they are biodegradable and compostable in a commercial composting facility. Green, biodegradable cup carrier trays are manufactured using eco-friendly processes, and their strong structure of natural fiber pulp will keep your customers’ beverages and the planet safe. Also make sure to check out other great items from Choice and Huhtamaki Chinet. These carrier trays will allow your customers to easily transport your beverages from your establishment to their home, office, child’s soccer game, or anywhere else their day takes them. 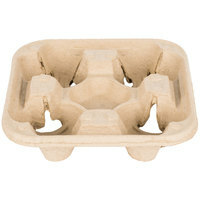 The biodegradable, compostable design makes the trays easy to dispose of without hurting the Earth. Our selection of green, biodegradable cup carrier trays features a variety of sizes, shapes, and configurations, so you’re sure to find exactly what you’re looking for. For some environmentally-friendly cups to hold your signature drinks, check out our recycled paper cups, green paper cold cups, and biodegradable plastic cups. If you're wondering where to buy choice biodegradable, compostable cup carrier trays, we have a large selection of choice biodegradable, compostable cup carrier trays for sale at the lowest prices.